Zero Discharge Industrial Wastewater Treatment Case Study | Applied Membranes Inc.
A zero discharge wastewater system designed by the Fluid Systems Division of UOP Inc. at San Diego, California and CH2M Hill of Bellevue, Washington has been operating successfully at the R.D. Nixon Power Plant since October, 1980. Operating savings are estimated at 50 percent over traditional alternatives. Process design for the facility was arrived at after examining several options. Unit operations for the system include clarification, filtration, reverse osmosis, and vapor recompression evaporation. The various options of the performance of the facility are reviewed. The R.D. Nixon Power Plant is located in Fountain Colorado. The plant site selection was based on a number of factors including its proximity to customers. This location put the plant 15 miles from the municipal sewer line and adjacent to a local freshwater stream. Any liquid discharged into this stream must comply with stringent effluent discharge requirements. However, discharge of plant effluent into the municipal sewer line would require a long pipeline at prohibitive costs. Therefore, the only viable option was to treat and recycle the plant effluent. The wastewater treatment system was designed by CH2M Hill, and the reverse osmosis system was designed and supplied by Fluid Systems. The overall cost of the wastewater system was approximately half the estimated cost of installing and operating a pipeline to the municipal sewage plant. Supply water for the power plant is obtained from wells located near the plant. Total requirement for the power plant averages around 1700 gallons per minute (GPM). Almost 90% of this usage is for make-up water for the cooling tower. The design analysis of the well water is given in Table 1. From the analysis it is clear that the concentration cycles in the cooling tower would lead to the precipitation of calcium phosphate, calcium sulfate, or silica. Well water hardness can be as high as 600 mg/l of calcium carbonate. The supply water is, therefore, softened by ion exchange resins (zeolite). The total hardness is reduced to less than 15 mg/l (Table 1). The softened water is used for the cooling tower and other routine uses in the plant. In fact, all plant wastewater other than sewage is treated by the wastewater treatment system. Nearly 60% of the total wastewater comes from cooling tower blowdown. The concentration cycles are limited by the solubility of the calcium phosphate still remaining in the softened water, as shown in a typical analysis of the cooling water blowdown (Table 1). The regenerant wastewater from the softener is the next largest source of wastewater, contributing nearly 18% of the total. As expected, the softener regenerant wastewater has very high concentrations of calcium. The third largest source of wastewater is the blowdown of the ash sluicewater (15%). A slipstream of cooling tower blowdown is used as make-up water to remove the bottom ash from the ash hoppers in the coal-fired power plant. The mixture of ash and water is allowed to settle in the ash ponds, and the supernatant from the last pond is continuously pumped back to the sluicewater tank. A portion of the liquid from the sluicewater is blown down continuously from the upstream of the sluicewater tank. The demineralizer regeneration waste contributes roughly 5% of the wastewater. The demineralizer is used to produce high quality water for the boiler. The majority of the water in the floor drains is water that was used for flushing various pump seals. The floor drains contribute about 2 percent of the total wastewater from the power plant. A representative analysis of some of the major wastewater streams and the combined plant wastewater is given in Table 1. 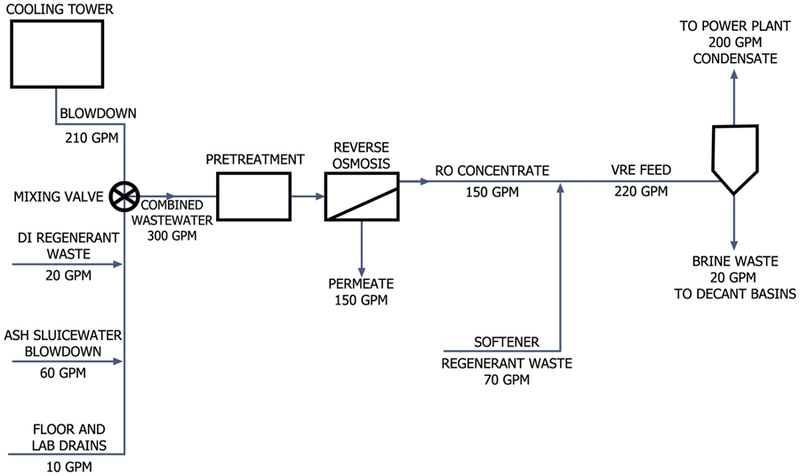 The combined wastewater analysis does not include the softener regenerant stream. The definition of waste streams from the power plant was the first step toward a process design for the wastewater treatment. The following section examines the process design options for various water and wastewater needs. Concentration and disposal of the final wastewater from (3). Several options were considered for each step. A brief summary of the rationale for each process selection is given below. Analysis showed that the cooling tower water quality requirement could be met by the removal of those scale-forming ions that limit the cycles of concentration in the cooling tower. The limiting ions in the composition of the well water supply are Ca-- and PO=4. Processes considered for the removal of these ions included lime-soda softening and ion exchange (zeolite) softening. Ion exchange softening was selected because the capital and chemical costs were lower. Sidestream lime-soda softening would remove calcium, magnesium, silica, and phosphate ions from the cooling water. For the water quality in the cooling tower, SS L/S was more expensive than reverse osmosis due to the requirement for a two-stage system to ensure hardness removal, higher chemical costs, and the higher cost of cooling tower construction materials required by a more saline environment. The quality of cooling tower blowdown required with SS/LS was similar to the reverse osmosis concentrate; therefore, final evaporation costs were roughly equal. Capital and operating costs for reverse osmosis are an order of magnitude lower than for VRE. On the other hand, there is a practical limitation to the maximum concentration of salts in water with reverse osmosis. Therefore, a combination of reverse osmosis and VRE was the most economical solution for the wastewater treatment. The projected quality of the permeate from reverse osmosis was considered suitable for cooling tower make-up water, and the condensate from the VRE could be used as boiler feedwater. Studies indicated that the entire need for boiler feedwater could be met by polishing the condensate return from the VRE by mixed bed ion exchange. However, a complete demineralizer train including carbon, cation, degassing, anion, and mixed bed units would be necessary as a back-up. Since permeate from the reverse osmosis units is of better quality than the softened supply water, the reverse osmosis permeate could be diverted to the demineralizer train if VRE condensate supply were cut off. Also, the excess condensate return could be sent to the cooling tower. To further reduce the volume of the concentrate from the vapor recompression evaporator, evaporation ponds were considered. Since land was available, evaporation ponds offered substantial savings to processing alternatives such as spray drying. An economic comparison of the different process design alternatives done by CH2M Hill is given in Figure 1. Based on these costs and other considerations discussed above, the process scheme for case 1A was selected. Evaporation ponds were chose for further concentration of the concentrate from the evaporator, and the solids collected in evaporation ponds were to be disposed of in landfills. *1976 costs for water and wastewater treatment and recovery facilities, plus any incremental costs incurred in teh cooling tower or boiler due to these facilities. Data provided by CH2M Hill, Bellevue, Washington. The wastewater from all sources, except the cooling tower, flows into an equalization basin. From there it is pumped through a mixing tank. Through valve control the wastewater to be treated can be obtained from the equalization basin, the cooling tower, or both (see Figure 2 and Figure 3). Chlorine, alum, and polymer are added to the wastewater and allowed to mix in the mixing tank. From the mixing tank the wastewater is pumped to the three parallel clarification and filtration units. Each unit contains a flocculation chamber, a clarification section employing tube settlers, and a mixed media filter. The filters and tubes are automatically backwashed. The filtration system is automated and a cationic polymer and ferric chloride are added continuously in proportion to the volume of wastewater. The filters are automatically backwashed if the filtered water has a turbidity of higher than 0.9 JTU. The clarified and filtered water flows into a clear well. The clear well serves a s a supply water tank for the reverse osmosis process as well as for backwash and surface wash for the media filter. The backwash wastewater flows into a sump which also collects water from the floor drains. The wastewater from the sump is pumped to the bottom ash ponds. Bottom ash is sluiced out of the wet-bottom ash hopper to the ash ponds once or twice a shift with large quantities of water. The resulting slurry settles in three 3-acre ponds connected in series, and the supernatant from the last pond is continuously pumped back to the sluicewater tank. The water from the clear well is pumped through a cartridge filter to the suction of the high pressure pump for the reverse osmosis system. Scale inhibitor and sulfuric acid are added to the water prior to the cartridge filter. The reverse osmosis system is divided into three parallel units containing Fluid Systems’ Model 8150 membrane elements. The operating conditions for the reverse osmosis system are listed in Table 2. The permeate from the reverse osmosis system is collected in a tank from where it can be transferred to either the cooling tower directly or to the boiler, if required. The concentrate from the reverse osmosis system is collected in another tank from where it is transferred to the evaporation feed tank. The evaporation feed tank also receives regeneration wastewater from the softener. Two reverse osmosis units can meet the normal plant flow requirements, and the third is on standby. Occasionally, the three units are run to meet peak demand. After pH adjustment and scale inhibitor addition, the liquid from the evaporation feed tank is pumped to the evaporator for a final volume reduction. The condensate from the evaporator is collected in a tank and pumped to the boiler feedwater supply. The waste liquid from the evaporator is sent to a decant basin where the salts are allowed to settle. The overflow liquid from the decant basin goes to evaporation ponds. Periodically, the salts from the decant basins are removed by solid waste handling equipment. The R.D. Nixon Power Plant has an excellent program to operate and maintain the wastewater treatment system. The entire operation can be monitored from a central control room, and an IBM computer prints out a weekly maintenance schedule. Water samples are taken at selected points for a more detailed analysis. The operation and maintenance of the wastewater system requires one operator and three maintenance personnel on weekdays and just one operator on evening shifts and weekends. The wastewater treatment system has been in operation since October, 1980 with very few problems. The system proved to be well designed and has performed as expected. The major problems included high calcium concentrations in the feedwater to the reverse osmosis systems. This was corrected by diverting the softener regenerant water from the equalization basin to the evaporator. Another problem arose because of improper coagulation in the pretreatment section. This was alleviated by changing the coagulant from aluminum sulfate to ferric chloride. The reverse osmosis system has performed extremely well, and no major problems have been encountered. The original membranes are still in use producing the design capacity and projected quality of product water. The analysis of feedwater, permeate, and concentrate is given in Table 3 at start-up of the reverse osmosis system in October, 1980, and in Figure 4 for September, 1982. These analyses indicate that the reverse osmosis system is still removing over 95% of the total dissolved solids in the feedwater. Cleaning of membranes with recommended cleaning solutions has been necessary once every two months. A high concentration of silica encountered in the feedwater has not been a problem. Under the reverse osmosis operating conditions (Table 2), the maximum silica allowable concentration in the feed is 70 mg/l. At higher silica concentrations, the recovery of the reverse osmosis is adjusted downwards. No unscheduled shutdowns of the reverse osmosis system have occurred. Scheduled shutdowns of the system include yearly power plant shutdown for a month and shutdown when there is a low level in the equalization basin. Power plant wastewater can be treated and recycled by using pretreatment, reverse osmosis, and vapor recompression evaporation. For situations where water is in a short supply and water costs are high, or when plant effluent must meet stringent standards, the zero discharge system described here provides the most economical and viable solution.